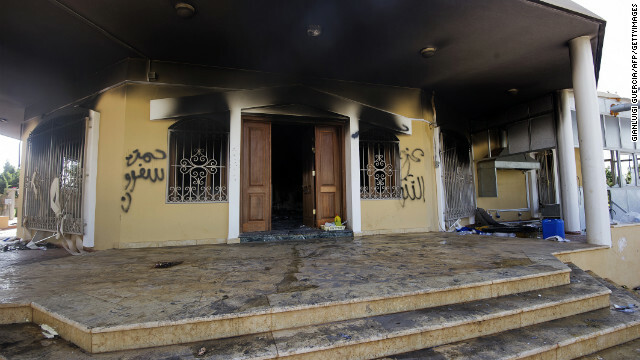 (CNN) - A senior House Democrat wants Republicans to retract a report claiming that former Secretary of State Hillary Clinton personally signed off on security cuts at the U.S. diplomatic compound in Benghazi, Libya, which later was targeted in a deadly terror attack. Republicans argued the conclusion, released this week, contradicted her congressional testimony on the matter, which was the subject of intense scrutiny. Maryland Rep Elijah Cummings, the senior Democrat on the House Oversight and Government Reform Committee, said the GOP finding was false and lacked a basic understanding of State Department procedure. The Republican report by the chairs of five congressional committees cites a request from then-U.S. Ambassador to Libya Gene Cretz last March 28 to Clinton asking for additional security resources, and a response on April 19 turning down the request that the report says bears Clinton's signature. In a letter to House Speaker John Boehner on Thursday, Cummings said his staff reviewed the cable in question and said it does not show Clinton’s signature. He said Clinton's name was typed on it like thousands of other cables sent from the State Department every year. "Although a telephone call could have clarified this issue in a matter of moments, you chose not to check with the (State) Department before making these highly inflammatory and erroneous accusations in a public forum," Cummings wrote in his letter. "The allegations in your staff report are false, extremely irresponsible, and lack even a rudimentary understanding of how State Department cables are processed," Cummings added. He demanded that Boehner apologize to Clinton on behalf of House Republicans. Boehner's office wouldn’t comment on Cummings letter. A spokesperson for Oversight Chairman Darrell Issa, one of the GOP leaders who drafted the report, backed its finding. "The document itself states ‘signature’ next to Clinton’s name. This cable shows that resource denial decisions did not just occur informally – in phone conversations and e-mails amongst less senior officials – but were actually run up the chain of command and made through supervised Department processes sanctioned under the Secretary’s authority." The September 11, 2012, attack in Benghazi killed U.S. Ambassador Christopher Stevens and three other Americans. The chairs of the Armed Services, Foreign Affairs, Intelligence, and Judiciary committees also worked on the report. The authors have asked the Obama administration to make the cable public. Fiverules, republicans have never been about finding out what happened. Changes were made. An independent report found issues and they were addressed. No where in that report did it state that millions of unread cables were the cause. And those millions of cables....that is pretty much how bureaucracies work. CEO's don't read everything. They have assistants to do that. Nor do your congressfolks. It did come from her dept, so she is ultimately responsible and she has taken that responsibility. However, all this report is trying to say is that she personally signed off on this and that may or may not be true. Either way, is this really what you think will solve what went wrong? If hypocrisy is a sin, hell will be full of Conservatives. Probably some Liberals too, but damn those Conservatives can wax eloquently the do the opposite. Jesus said, "Take the beam out of your eye first before you try to remove the splinter in the eye of your neighbor" Matthew 7,3. George W. got a free pass for letting THE 9-11 Attack happen on his watch. A Dem. Prez would have been Tarred & Feathered & then Impeached. I swear if Obama came out supporting sunlight the republicans would become vampires. Thanks for the laugh this morning! So true! ....those millions of cables....that is pretty much how bureaucracies work. CEO's don't read everything. They have assistants to do that. report that was handed to him on Innaguration Day 2001. Perhaps if he had done so or tasked someone else to do so, and also taken his August 6, 2001 PDB entitled "Bin Laden Determined To Strike U.S" seriously we wouldn't be where we area right now. The truth hurts, but it is what it is.